This AidCamp was held in conjunction with our partner organisation Future In our Hands, Kenya (FIOHK) in the rural community of Buburi in Kenya. 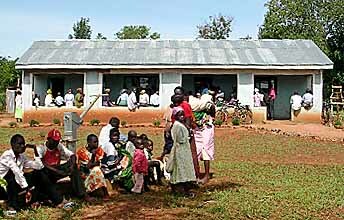 The project financed a 88sq.m (968sq.ft) local health centre in the community, an area where HIV/AIDS has reduced average life expectancy to forty, the volunteers being involved in helping out in the construction of the building. The volunteers were also taken on quite a few visits to see FIOHK's work in the area, as well as on several local and regional sightseeing trips, during which they spotted some of Kenya's wildlife, including hippopotamus, impala, waterbucks, buffaloes, and colobus monkeys. "Touching down at Nairobi Airport, just as the African dawn was breaking, felt thrilling enough. However, we had little idea that this was just the beginning of the most unique, unusual and memorable three weeks. It was filled with unexpected challenges, meeting brave, courageous new people, witnessing different cultures and culminated in the most rewarding, fulfilling, and worthwhile experience. The chaos and drama of the streets of Kenya's capital were soon left behind as we took an internal flight to Kisumu on the shores of Lake Victoria. From here the journey moved to the roads, an experience all of its own! We then began to understand the comments and advice from the Lonely Planet guide about the dangers of travelling in a matatu minibus. We eventually arrived at Buburi, a remote community, nestled beneath some hills, near to the equator and close to the Ugandan border. In this community, there was no available or free access to health care, the nearest hospital was some considerable distance away. All these people had been affected by the devastation of HIV and AIDS, exacerbated by living in extreme poverty. 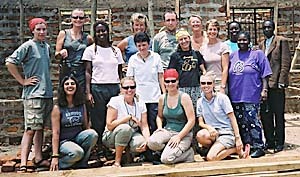 We joined a team of local builders organised by Future in our Hands, Kenya, the local charity working alongside AidCamps. We helped to lay bricks, erect fences, mix sand and cement, construct roof trusses, dig earth toilets, and collect water from the borehole. These young men were initially both puzzled and fascinated that women would help with what was considered 'men's work.' However, these reactions were short lived. Their acceptance of us and enjoyment of sharing the experience became very apparent. Even when they had to redo our building efforts, there were no complaints only laughter and good humour. Sharing the kitchen duties with the ladies allowed us to become friends and gain an understanding and insight into their lives. Their lives were hard. They had no luxuries and even the basics were often not met. 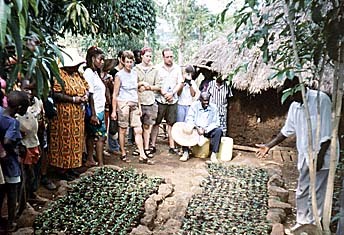 Many were widowed trying to care for children and grow their crops in order to try and make ends meet. There were many orphans. Despite this they welcomed and cared for us as part of their own families. We were fortunate enough to visit some of the local schools and spend some time with the children, they sang for us and treated us like honoured guests. Despite very primitive learning conditions these children were extremely bright, intelligent and eager to learn. It was extremely touching. By the time we had to leave Buburi we all understood that a huge success had been achieved within this community. And we, the volunteers, had had this unique opportunity to share a tiny part of our lives with these amazing people. Each one of us had been affected deeply by this very privileged experience that would be very difficult to ever recreate." "To really get under the skin of a country and it's people AND to be able to leave something valuable behind was an amazingly rewarding way to spend 3 weeks. Every single day, every single person is etched on my memory forever." "Having the opportunity to witness rural African life was incredible, and contributing to the community in a meaningful way made it even better." 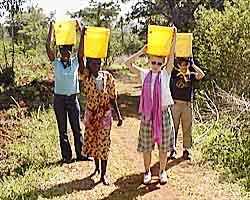 "My three weeks in Buburi, Kenya has to rate as one of the most moving and enjoyable experiences of my life! I have the greatest respect for our Kenyan friends. It was a humbling experience." "Where do I start? Three weeks of a totally different way of life, I can't wait to go back to build some more!" "This was a very unique opportunity to experience the most rewarding and amazing experience that is rare in a lifetime. I would recommend this to anyone who really wanted to dedicate fullheartedly a small part of their life to sharing and learing from some amazing people living in extremely primitive and difficult conditions. A chance to try and help improve a tiny part of their lives." "Overall it was a great experience and I got to make a lot of good friends. Would definitely do this again." "Having the opportunity to be immersed in such fascinating local culture is an experience I will never forget. To be directly involved in enhancing local lives and making a real difference is an honour. Thanks AidCamps!!" "A big eye opener. Had a great time with a group of people I had never met before. I didn't think I would miss a squat toilet but I think I did!!!" "To really get under the skin of a country and it's people AND to be able to leave something valuable behind was an amazingly rewarding way to spend 3 weeks. Every single day, every single person is etched on my memory forever." "Having the opportunity to witness rural African life was incredible, and contributing to the community in a meaningful way made it even better." "My three weeks in Buburi, Kenya has to rate as one of the most moving and enjoyable experiences of my life! I have the greatest respect for our Kenyan friends. It was a humbling experience." "Where do I start? Three weeks of a totally different way of life, I can't wait to go back to build some more!" "This was a very unique opportunity to experience the most rewarding and amazing experience that is rare in a lifetime. I would recommend this to anyone who really wanted to dedicate fullheartedly a small part of their life to sharing and learing from some amazing people living in extremely primitive and difficult conditions. A chance to try and help improve a tiny part of their lives." "Overall it was a great experience and I got to make a lot of good friends. Would definitely do this again." "Having the opportunity to be immersed in such fascinating local culture is an experience I will never forget. To be directly involved in enhancing local lives and making a real difference is an honour. Thanks AidCamps!!" "A big eye opener. Had a great time with a group of people I had never met before. I didn't think I would miss a squat toilet but I think I did!!!"